Interview with a Zinester: Tale of the Gray Wolf! Next up we’re excited to have some words from Tale of the Gray Wolf! 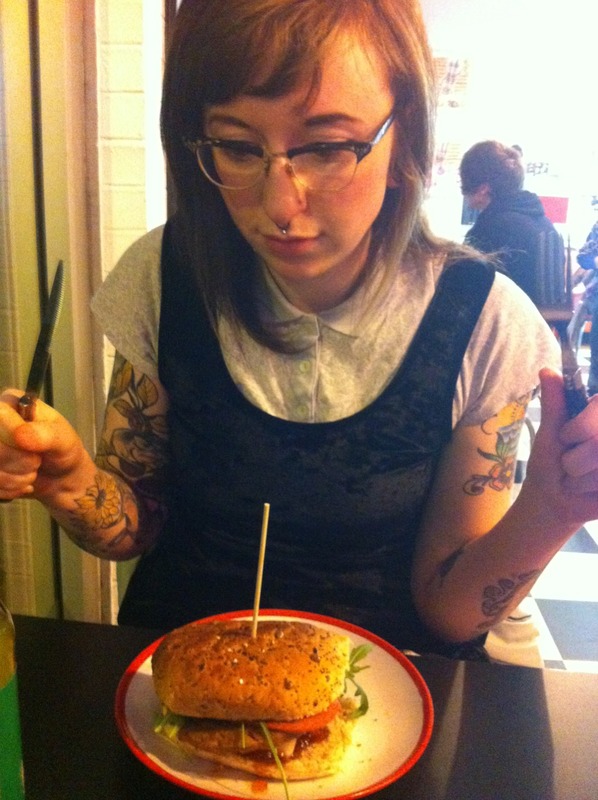 Photo of zinester for Tale of the Gray Wolf with fork and knife in hand, about to dig into a burger. I am a vegan, queer-identifying human who grew up in the UK but is currently living in Toronto, Canada with my cat Pickle. I constantly like to have something creative going and regularly make zines and patches under Tale Of The Gray Wolf, and soap and other body products under Speckled Fawn Soaps. My content with Tale Of The Gray Wolf tends to reflect whatever I am feeling passionate about, including queerness, feminism, mixed race issues, animals etc. I first discovered zines a few years back when a friend had some in their house. I read a few and found it really interesting to have a peek into the lives of the people that wrote them. I later attended a couple of zine events in the UK and realised there was no limit to what you could make them about, and that anyone could do it! As for influences, I feel like I am constantly being influenced by so many people. A lot of my friends both in Toronto and the UK make zines and it’s really inspiring and motivating to see others being creative around you. To me, feminism is just one way of working towards many oppressions we need to fight against. I try and cover all kinds of anti-oppressive politics in my zines, and much of what I write about is to do with what I have learnt over time, such as understanding the individual circumstances of others in my life and the struggles they may feel, as well as communicating my own, and I feel like these are key parts of a feminist attitude. Probably a slow cooker. It often takes me a while to process my thoughts and turn them into something creative, but I feel really accomplished when I have taken the time to get something finished in the way I want. I’m excited to be tabling alongside fellow Torontonians The Wheelhouse, as well as catching up with Sarah of How Are Your Insides who I met recently at LA Zine Fest. Otherwise, I am still relatively new to this side of the world so I can’t wait to meet new people and discover all of the awesome work that they do! Previous Previous post: Interview with a Zinester: Sy Abudu! Next Next post: Interview with a Zinester: The Wheelhouse!